*Try to pick scents that will complement each other, my soap is lime and my oil is eucalyptus. It smells so fresh and clean! Vanilla extract would be a complement to almost any dish soap scent. Mix all ingredients well to form a wet sugar. 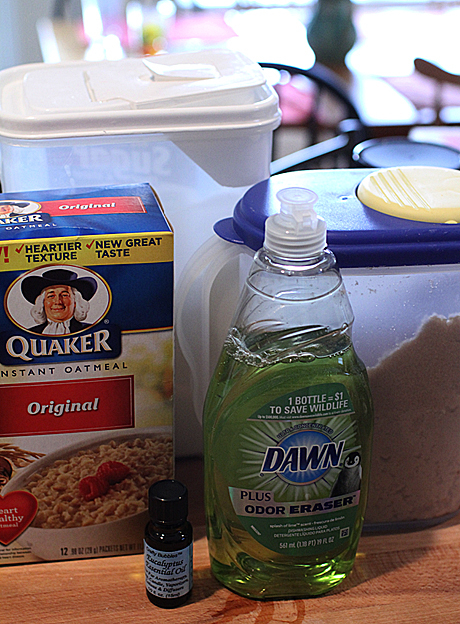 You will initially think you need to add more soap, but continue to mix, the sugar and oats will absorb more than you think. You want people to scoop a little onto their hand, so it needs to be a solid and not runny. 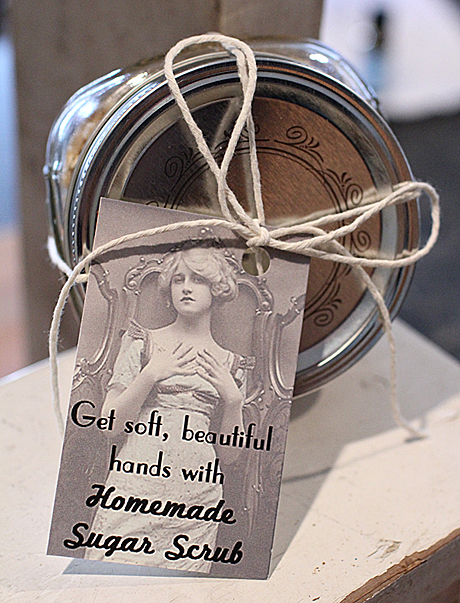 If you are gift-giving, this butcher twine and label will launch you into sugar scrub professional! When you wrap the twine around and back to the top, make sure to secure it all together in a knot, this will prevent it slipping off the jar. Now tie on this handy label that I made (Printable Sugar Scrub Label)… and you’re done! Christine is a fashion merchandiser and DIYer blogging at GreatOakCircle.com. She loves the Lord and serving others through cooking and creating unique gifts. It looks really pretty but the dish soap doesn’t dry or strip your face? Dawn esp is for removing oil. Just curious. Thanks for the great idea! Love this! Do you happen to know how long the shelf life would be on this? Or maybe it will be fine as long as the lid is replaced each time? I love the variety of your blog! this is a hand scrub? Huh, seems unique. maybe I should try it. Some people prefer a soap base to clean and ex foliate at the same time. Shaklee’s Basic H may be another good suggestion worth trying:) Or a simple hand soap may also work. There is really not a wrong answer for the liquid part. 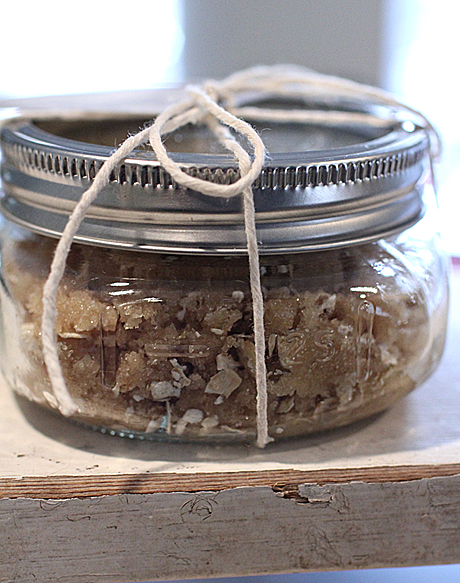 You can also experiment with brown and white sugar and oatmeal, or even make a salt-based scrub. Since you are using sugar and other perishables, you would want to use it within 6 months probably, I know I have had mine for about 3 months and it looks and feels exactly the same as when I made it. Depending on the products you use, you may need to stir it up a little. wow! $5 dollars! i am going to keep up with your site to learn more. I just made this scrub. Oh.my.gosh. fabuloooooso! I used hand soap instead of dish soap. I mixed lavender essential oil with almond extract. About 5-7 drops of each. letmetellya! So devine! My hands feel crazy awesome good and the smell, well…it about took me out…in a yummy way! printed the label, too. So cute. I made this scrub with vanilla from my kitchen and used the raging rapids dish detergent and the smell turned out perfect for men. I made this for some fathers day gifts. My scrub turn out more runny then solid, but I tried it and it worked wonders, so I’m just gonna leave it the way it turned out. They’ll just have to use a spoon to get some out. I even layered the scrub on top of the last of the scrub and mixed maple in it. Wow the colors were very pretty!